“Photographs (1898-1937) People and Places,” Digital Rose Hill, accessed April 19, 2019, https://rosehill.digitalsckls.info/item/36. Roy Williams bought the home of Anna Hall. House was moved to West Thomas Street where it is still occupied. Home of Joseph L. and Anne Hall located on Rose Hill Road just south of business buildings. Street scene , east side of the main street street was called Parallel St.
Greetings from ROSE HILL, KANS. At the time this picture was taken this street was called "Parallel St.
sold for a bank building in 1906. 1905 map listed as Thomas Bldg. South store building was built by Elias Mitchell. Elias Mitchell and Lewis Carr opened a general merchandise store in 1900. The year it was built. ing points for years? He was the man. He and J.E. Cooley were associated together for years. Later he and William Poston were together. Center building belonged to Jonathan Thomas, built in J. 10 Livery stable in the front. 3. Rosa Silknitter's post office, ice cream parlor, millinary shop and many others. Was a barber shop in later years. Rosa lived in the attached house to the rear and south side. 6. Large 2 story building facing south is I.O.O.F. hall built in 1906. 7. Back side of Bank Building, opened as a bank in 1906. James McCluggage was director and president. 8. This building belonged to Johnathan Thomas and housed several different businesses. In the Douglass Tribune it always referred to it as "The North Store*. 9. The Mitchell building, built by Elias Mitchell in 1900. ✓ to in the Douglass Tribune as "The South Store". The long looked for day of house moving has arrived and the house that Julia Hinshaw bought was placed on her lot in south west part of Rose Hill on Saturday evening. carpenter shop; 5. the Rose Hill Bank building; 6. King’s house; and 7. the Rose Hill Elevator. This 1907 view is from east of Rose Hill looking northwest. Where are all the trees? The homes are numbered. 1. the McClnggage house; 2. the Methodist Church; 3. the Poston house; 4. the Swindell house; 5. Dr. Barkelow’s home and office; and 6. Hugh Baker’s house. 1. Building referred to as the Dennett Building. This building housed many a business, barber shop, restaurant, meat market, feed store, creamery,harness shop. Was built with 2 front doors for 2 businesses. 2. Post Office of Rosa Silknitter. She also had an ice cream parlor, milinary shop, served meals. In later years it was a barber shop. Rosa lived in the building attached to the rear and south side. Rose Hill is making preperations to celebrate the 4th of July in grand old style, under a large tabernacle. One feature will be a military flag drill by 20 young ladies, drilled by Miss Amanda Hull, who will have charge of the program. Rose Hill is to have a regular old fashion celebration the 4th. Don't forget, good music and races, fine speaking and a splendid dinner if the country people will bring it in. George M. Showalter, one of Butler county’s successful farmers and stockman, is a native of Iowa, born in 1869. He is a son of Samhel •and Belle Showalter; the father was born in, West Virginia, and Belle Greenland Showalter, the mother, was born>pear Mt. Carroll, 111. The Showalter family came to Sedgwick county, Kansas, in 1876, and located on a farm in Gypsum township, where the father bought 320 acres of land, which is still in the family. Samuel Showalter died in 1904 in Wichita, and his wife now resides there in the home he bought prior to his death. This home is modern and commodious, very much in contrast to the one built on the old homestead in 1876, which was 12x16 feet, and in which they lived eight years. George Showalter, the subject of this sketch, was educated in the country schools of Sedgwick county. His parents were very desirious that he should have a college education, and then take tip the profession of law, but he chose farming and stock raising instead, in which he bias made an unqualified success. He owns 1,200 acres in Pleasant township. which is one of the best farms in the county. It is well improved with a modern home, large barn 44x80 feet, silo 14x30 feet, with ten font basement. 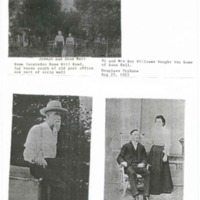 Mr. Showalter was married, in 1894, at Wichita, to Loretta Estella Swindell, a native of Indiana, and a daughter of Joshua Swindell, who came to Kansas in 1880, and settled in Pleasant township. Tier mother was Gula Wilson, prior to her marriage. She was a native of North Carolina. Mrs. Showalter has three brothers living, as follows: Roscoe, Adolphus and Ernest. Mrs. Showalter’s father came from Indiana to Arkansas, and front Arkansas, he came to Butler county with an ox team, and had twenty-five cents, when he got here. He used oxen for j several years after he came. Their first home was 14x16 feet, in which i they lived ten years. Mrs. Showalter’s father came with a mule team, as lie thought horses could not live here then. Mr. and Mrs. Showalter are the parents of nine children, all of whom are living at home, as follows: Floyd C., William E., Grade L., Gula B., Roy F.., Earl L., Worth L., Edna A. and Leburn G. Mr. and Mrs. Showalter have worked hard, and their efforts rave been crowned with success. Mr. Showalter has three sisters, all graduates from Kansas State Normal, and all of whom were very successful school teachers in Butler and Sedgwick counties. Another street seen looking south on the main street. This is a later picture than the proceeding one. The tall house on the right is the Raida house built in 1908. It is not shown in the other picture. People on the front porch of the first building on the left are the same people in the picture of Kent Johnson and Gilbert Johnson’s barber shop and restaurant . Date on that picture is 1908. Original of this picture belongs to daughter-in-law of Kent Johnson, Emma Johnson. located beside I.O.O.F. hall , 100 blk of West Berry St.
Henry Perry Silknitter, was born July, second, 1841,'near Dayton, Ohio, and departed this life October 5, 1923 at the age of 82 years, 3‘ months and 3 days. When nine years of age, he with hio parents moved to Appanose County, Iowa. March 18, 1863, he was united in marriage to Martha A. Thornberry. To this union wa& born 11 children, four of which have proceeded him to the world beyond, three in infancy and one, John Ellsworth in manhood. He leaves to mourn his loss, his wife, one son, Charlie F. and six daughters, Mrs. Carrie F. Baker, Mrs. Minnie F. Jones, Mrs. Gertrude M. Jones, all of Rose Jlill, Kansas, Mrs. T. L. Crabb, of Garden City, Kansas, Mrs. Katie Ballard’of Los Angeles, California and Mrs. Chlce Williams of . Denver, Colorado.^ Twenty-two grand children, seven great grand children, five brothers and one sister. They are: John, Frank, and Solomon of Centerville, Iowa,' Hiram W. £nd Jacob A. ‘of Rose Hill and Mrs. Rebecca Thompson of Maryville, Missouri. !, He was a kind and loving father and husband. All through his seven months sickness, it was "just as it had been all through His .life, such a beautiful lesson of patience^ not a ; murmur, everything that was done, and by whoever it was alright, and the only thought xof it being a hardship in caring for him, by his loved ones, was that it would too scon end. He was converted! in Appanoose County, Iowa, in 1864, and united with the Presbyterian church. In the spring of 1872 he came to Kansas and filed on the claim in Sedgwick County," to which he still holds the government deed, as signed by President U. S. Grant. In November of the. same year he moved his family to the pioneer home. He with his family stayed on. the farm until the spring of 1893 when lie moved tn Rose Hill, where he lived until his death. In the spring of 1873 he organized and conducted a union Sunday school at the little Spring Creek school house, later the Methodist Protestant organized, and he was a charter member. The class was transfered frort Spring Creek to Sampson school house and from there to the Rose Hill church in 1899, to which he was a true and faithful member to the end. Our great loss is heaven s gain. ! Charley Silknitter is planning to put up a building soon, and will move the post office in to it when completed. We are wanting your produce. tiet the highest market price by dealing with us. *	. Phil Kinsey bought of Joe Hall the "Harrold" house lately vacated by them. I received these postal today. Mary and P,R, Kinsey's Home My fathers house is south of the bay window Picture taken from the west front. This house was located where the present post office is now. , Dunlap were united in> marriage at noon j on Thursday of last week at the home of the bride’s uncle and aunt, Mr. and Mrs. P. R. Kinsey, at Rose Hill. As Mi3s Ina Webster played the Mendelssohn wedding: march the bridal party entered the | parlor, the bride attended by Miss Dawna Baxter as bridesmaid, and the groom by Mr. Alonzo Pratt as best man. The mariage rites were performed by Rev. J. L. Johnson of the Congregational church. The bride looked lovely in a cream handsowne gown, made directorie empire, i entrain, and trimmed in lace and satin. She carried a shower bouquet of Bride’s roses. The bridesmaid wore a white silk mull over pink, made princess. She car- j ried a. bouquet of pink carnations. After congratulations, a delightful wedding dinner was served in the dining room. Mr. and Mrs. Dunlap have lived in and Inear Rose Hill al* their lives, and are highly respected by all who know them. They will be at home to their friends after January 1 in their new cottage in the north part of Rose Hill. Among the guests who were in attendance at the wedding, several of whom were from Wichita, were: Mr. and Mrs. Pratt, parents of the bride; Mr. and Mrs. Dunlap, parents of the groom; Mr. and Mrs. P. R. Kinsey, Mr. and Mrs. Baban Dunlap, MY. and Mrs. John Dunlap, Mr. and Mrs. J. J. Branson, Mr. and Mrs. W. N. Harris, Mr. and Mrs. S. J. McCullough, Mr. and Mrs. W. H. Dennett. Mr. and j Mrs. S. S. Hawks, Mr. and Mrs. Isaac Smith, Mx. ami Mrs. Frank MdGee, Mr. i and Mrs. Frank Dunlap, Mrs. Rogers of Waynoka, Okla., Mrs. J. R. McWilliams, Miss Dawna Baxter, Miss Ina Webster, Miss Bonetta Jones, Miss Mary Jones, Miss Bleanor Branson, Miss Dorothy Dunlap, Miss Irl Pratt, MY. King, Mr. Clarence Pratt, Mr. Alonso Pratt, Mr. John Branson, Mr. Roo M^ul^ough, Mr. Virgil Cook, Mr. CecityMbfcuilough, Mr. Frank Rogers. house is still occupied, has had a 2 story addition built on back. Mr. Poston has just purchased the home of Ike Dunlap on Parallel Ave.